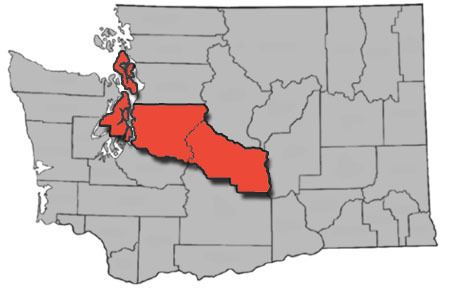 Taken together, Island, King, Kitsap, and Kittitas Counties represent a land area of 5,028 square miles, about four percent larger than Connecticut. They compose a broad, southeasterly-trending, 175-mile transect extending from Smith Island in the eastern Strait of Juan de Fuca across the Cascades to the Columbia River below Sentinel Gap and covering about 1°40´ of latitude, or some 116 miles from north to south. Elevation reaches from sea level to 7,899 feet at the glacier-clad summit of Mount Daniel on the Cascade crest (see Figure 1). The region displays a great range of climatic conditions, with average annual precipitation measuring less than 10 inches at the eastern edge of Kittitas County but exceeding 100 inches at Snoqualmie Pass. Consequently it embraces many of the state’s vegetation zones and a great diversity of habitats with their associated birdlife. The name we have chosen for the atlas publication, Sound to Sage, expresses this diversity. We might just as appropriately have called it Puffins to Poorwills: 213 bird species, representing 86 percent of those that nest regularly in the state, nest in one or more of the four counties. The following description of the mapping grid has been freely adapted from Smith et al. (1997). For survey purposes the state was divided into a grid of “atlas blocks” determined by Washington’s township/range/section system. Townships form the rows of the grid, and ranges form the columns. All of the townships in Washington are designated as “north,” with numbers ascending from south to north (T15N, T16N, etc.). The range-numbering system ascends eastward (R1E, R2E…) and westward (R1W, R2W…) from the Willamette Meridian, which runs north and south through the state from Blaine on the Canadian border to the confluence of the Columbia and Willamette Rivers. Nearly all of our four-county area lies east of this meridian; parts of just three ranges at the western edge of Island and Kitsap Counties lie to the west of it. Each entire township/range is comprised of 36 units called sections, each measuring one mile on a side (one square mile in area). These are arrayed to form a square six miles on a side, or 36 square miles in area. Within each township/range the sections are numbered consecutively from 1 to 36, beginning in the northeast corner then zigzagging back and forth from top to bottom, six sections per row, until reaching Section 36 in the southeast corner (see Figure 2). An atlas block is one quarter of a township/range and consists of a square three miles on a side, or nine square miles in area (see Figure 2). Blocks are designated by their geographic position: NE, NW, SE, or SW, added at the end of the township/range coordinates. Some examples: T32N R1E SW (Penn Cove on Whidbey Island), T25N R1W SW (Seabeck on Hood Canal), T26N R5E SW (Juanita Bay on Lake Washington), T20N R20E SE (Colockum Pass in Kittitas County). Township, range, and section boundaries are depicted on many readily available maps such as the Washington Atlas and Gazetteer (DeLorme Mapping Company), USGS topographic maps, and USFS national forest maps. All were determined by on-the-ground, chain-and-transit surveys a century and more ago, long before the prevalence of aerial photography, laser instruments, and satellite telemetry; thus they betray numerous imperfections and inconsistencies, especially in regions of difficult or densely forested terrain. In many cases, due to township/range irregularities, atlas blocks are oddly shaped or do not represent exactly nine square miles, but in all cases the blocks were defined by the actual survey lines. Two instances of “adjustments” to the ideal grid are worth pointing out, to avoid confusion. R12E is only three sections wide where it crosses western Kittitas County and part of eastern King County; thus no blocks in this range in T18N–T24N are designated NW or SW. In northeastern King County an east–west strip about a half-mile wide, designated T24½N, has been inserted between T24N and T25N in Ranges 11, 12, and 13. Atlas teams did not census these anomalous bits separately. Instead, they were combined with the respective atlas blocks immediately adjacent to the south, in T24N. Our area has 667 whole or partial atlas blocks. If a block lies in two counties each part was surveyed separately. Many blocks are cut across by shorelines or natural boundaries such as the Cascade crest and as a result have a land area less than the nominal nine full sections. Our rule for survey purposes was to accord full status to such partial blocks if their land area equaled or exceeded five percent of a complete block (as a rule of thumb, one-half section or 320 acres). Block fragments below this threshold either were not surveyed, or were combined with another adjacent block.